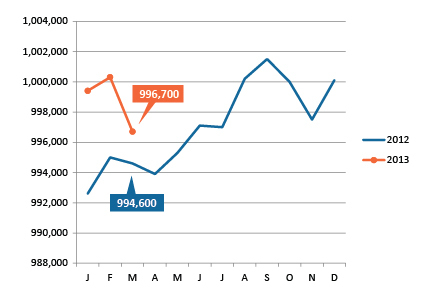 After topping the 1 million mark in February, Kansas City area employment fell to 996,700 in March. 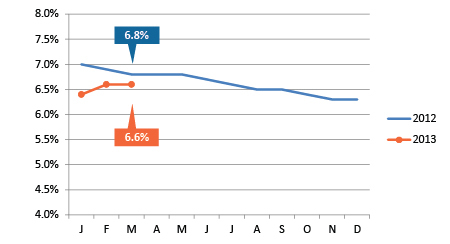 The regional unemployment rate stayed level at 6.6 percent. Employment data shows us what has happened in the past, but the big Kansas City employment news is what's ahead. In late April, Ford announced that 900 new jobs are coming to its Claycomo plant. Adding 900 new jobs is significant in and of itself, but there is even better news beneath the surface of this announcement. Not too long ago, General Motors announced a major reinvestment in its Fairfax plant. When both the GM and Ford investments are completed, the two plants will directly employ approximately 8,000 workers. That word "directly" is key. The indirect impact will be even greater. Manufacturing jobs beget other jobs. Large manufacturers like Ford and GM need a constant supply of materials that go into their products. And suppliers can benefit greatly by locating closer to their large customers. Because of this, the manufacturing industry has a large multiplier effect. One new manufacturing job can generate an additional 3.5 additional jobs elsewhere in the economy — everything from other manufacturers in the supply chain to indirect industries like health, education or retail. We will not see the fruits of these new job announcements immediately. It will take time for Ford and GM to get up to capacity and for the full job impact to work its way through the economy. But these companies are planting the seeds that will bear fruit in our local employment picture in the years to come. Employment dropped by 3,600 in March, but remains above last year's level. The seasonally adjusted unemployment rate held steady at 6.6 percent for the second month in a row. 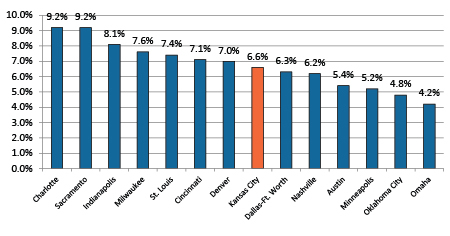 At 6.3 percent, Kansas City's unemployment rate remains firmly in the middle of our peer metros. 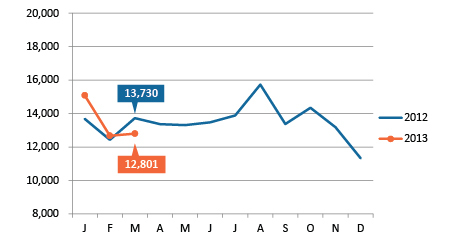 Job postings are down from the beginnning of the year, but they remain steady at just under 13,000 per month. Our latest infographic illustrates year-over-year employment change by industry in the Kansas City metro area. Blog examines employment data by gender, race and education. Our KCEconomy blog often delves deeper into data to look for trends in employment. Recently, we followed up on a popular post from last August about occupations by gender (Are nurses from Venus and Engineers from Mars? )to see what other factors might affect employment opportunity. In early April, we examined employment trends by gender and race, and found a significant connection with earnings. For example, eight of the top 10 occupations that are disproportionately held by minorities have median earnings below the overall median. On April 26, we took this analysis a step further: Is it really race or gender that drives these discrepancies, or does it have more to do with educational attainment? Follow our blog for more analysis of workforce data and other topics that impact the Kansas City regional economy.